Image is important to our Taoiseach. His previous Twitter handle @campaignforleo described him thus: "Taoiseach, fitness fan. Has been known to talk too much. Likes to travel. Saviour of the Poolbeg Stacks." A few weeks ago, the Taoiseach informed his Twitter followers that the campaign for Leo was over, as he now has a new handle @LeoVaradkar. This account still describes Leo Varadkar as Taoiseach, but now also "Leader @FineGael. TD for Dublin West. Likes to Talk. Travel. Sunshine. Concerts. Leinster and Dublin fan". Gone are the Poolbeg Stacks, with sport, weather and music taking their place. And also a gracious reference to the two bodies without whom he could never have been Taoiseach - his constituents for electing him to the Dail, and his party for electing him its leader. Leo Varadkar advised his 200,000 Twitter followers that for "unique content" on his "day to day work", they should check out his Instagram page. So far, this has just 12,000 followers (the Portuguese footballer Cristiano Ronaldo has 160m), and it contains a series of photographs and videos from the Taoiseach's meetings with political leaders, and choreographed political events. Clearly, there is a particular image the Taoiseach is carefully trying to create and manage. It is of someone at one with a young, modern, liberal, and politically correct Ireland. Gone is the Leo who in 2008 suggested paying immigrants to return home as a way to reduce the numbers on the live register. Gone is the Leo who in 2007 told the then Taoiseach, Bertie Ahern, that the gutter was his "natural habitat". Gone is the Leo who attacked Garret FitzGerald, one of his predecessors in Fine Gael, not just for his record as Taoiseach, but also for his post-political career as an Irish Times columnist. In an outburst in the Dail in 2010, Varadkar told the then Taoiseach Brian Cowen: "You're a Garret FitzGerald. You've trebled the national debt, you've effectively destroyed the country and now you've a dirty, wasteful botch job of a reshuffle. And it's the last thing you do so enjoy writing your boring articles in The Irish Times in a few years." Leo Varadkar wants you to forget about this side of him. He wants you to buy into the assumption of the foreign press that because he is young, gay and of foreign descent, he must be an exotic liberal. 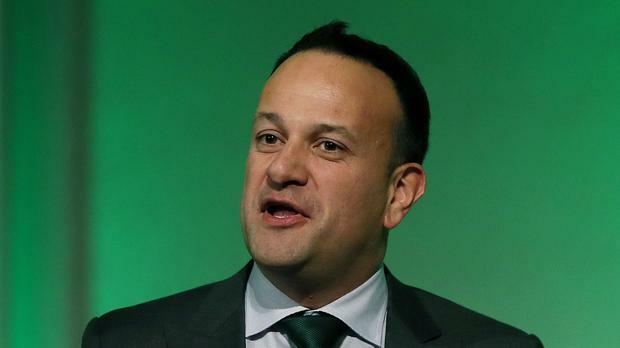 Since he became Taoiseach, Leo Varadkar has carefully cultivated an image that at times is at odds with his previous political stances, but which affords him some gravitas as the leader of a new Ireland. Anything which contradicts this image is seen as a threat. It came as no surprise then when it was revealed in the Mail on Sunday last week that the Taoiseach's office had twice refused Freedom of Information requests to release to the media a letter written last year on government-headed paper to the Australian pop star Kylie Minogue. It read: "Dear Kylie, just wanted to drop you a short note in advance of the concert in Dublin. I am really looking forward to it. Am a huge fan! "I understand you are staying in the Merrion Hotel which is just across the street from my office in Government Buildings. If you like, I'd love to welcome you to Ireland personally. Leo V Taoiseach (Irish Prime Minister)". While this sounds like something out of RTE's Callan's Kicks, the letter is at worst "cringeworthy", in the words of Fianna Fail TD James Lawless. But that is all. The greater error was the Taoiseach's attempt to block its release, perhaps indicating that he agreed with Lawless, who also said it was "demeaning of the office". In a week when we had the Taoiseach attempting to prevent the media from seeing his real persona, one of his cabinet colleagues couldn't stop talking to journalists to tell them what he really thought. In an interview in this newspaper last Sunday, the Minister of State for Disability Issues, Finian McGrath, lambasted the increase in the 'morning-after' breathalysing of motorists. He claimed that some gardai are uncomfortable about these checkpoints, and were telling drivers that his Independent Alliance colleague Shane Ross, the Minister for Transport, was to blame. But, no sooner than he had speculated about political policing, Minister McGrath was as quick to retract his statement: "I was wrong to suggest there was any element of politicising within the force over the new drink-driving regulations." McGrath further said: "My comments in this morning's Sunday Independent were prompted by concerns raised with me over the past number of weeks. I acknowledge that these concerns were wrong and I am happy to withdraw my comments." While this story potentially has more ramifications than the Taoiseach's letter to Kylie Minogue, what both incidents reveal is how cautious, and perhaps fearful, politicians are of the public knowing what they are really like, or are really thinking. It brings to mind Brian Friel's play, Philadelphia, Here I Come!, set in 1960s Donegal, in which the central character, Gar O'Donnell, has two sides, Public Gar and Private Gar. Public Gar is described as "the Gar that people see, talk to, talk about", while Private Gar is "the unseen man, the man within, the conscience, the alter ego, the secret thoughts, the id. Private Gar, the spirit, is invisible to everybody, always". Finian McGrath initially revealed a bit of Private Finian in his interview last Sunday, but very quickly he was pushed to one side, as Public Finian sought to keep his job in cabinet. Public Leo is all we ever see of the Taoiseach. It is difficult to know or guess who is Private Leo. His image has been carefully cultivated, from one of a conservative reactionary on the opposition backbenches, to a traditionalist conservative in the Fine Gael leadership contest, to a new position as an oxymoronic liberal conservative. The consequence is that we have no idea who is the unseen Leo, the man within, the conscience. And more's the pity for it. It's not as if the Irish public is a pious lot who demand an airbrushed, squeaky-clean leader. A lovable rogue is seemingly more favourable, which is why Charlie Haughey and Bertie Ahern were popular, but the likes of Brian Cowen and John Bruton were not. Today's politicians are so afraid to speak their mind (President Trump being a notable exception). They say what they think ought to be said, rather than what they really think. And the consequence is that we have no idea who we are voting for, lessening the value of our democratic choices. In Philadelphia Here I Come!, Public Gar was not the real Gar. He was gruff and bravado, putting on an act, and pretending not to care. This masked the real Gar, the Private Gar, who although quite cutting at times, told the truth and confronted his feelings. We learn nothing from Public Gar; all the insight comes from his alter ego. What do we learn from Public Leo? That he likes concerts and sunshine? Don't hold back, Taoiseach. No one really cares about your letter to Kylie. If anything, sounding like a gushing fan made you more human. Stop trying to hide Private Leo. We used to see more of him in the past. We mightn't have agreed with all his statements, but it was refreshing to hear some honesty, and to hear someone not afraid to say the unpopular. Would the real Leo please stand up?